Home > What is the Best Pitching Machine for me to buy? When it comes to choosing the best pitching machine, there are a lot of choices and it can get pretty confusing, figuring out the subtle differences between the various pitching machines. Naturally, the best machines are the most expensive ones but price, alone, doesn't necessarily indicate the right pitching machine, particularly for each person's unique situation. Many people don't have unlimited budgets and $3,100 pitching machines are out of the question. What most people really want to know when they ask "what is the best pitching machine?" is "which pitching machine should I buy?" or, more to the point, "what is the best pitching machine for my family and budget?" Before you can decide what the best pitching machine is for your particular situation, you really need to figure out what the most important factors are to you. Ultimately, your decision needs to be based upon many different factors - money, of course, being one of them. For those who simply want to know what the 10 best pitching machines are, whether they are necessarily the best for their particular situation or not, this section is for you. You'll probably want to read further, however, to see what really matters in a pitching machine and why the subtle differences may affect which one you choose for your family or team. Here are our top ten pitching machines in order, starting with our favorite, along with their normal discount prices. Prices may be even lower if there is a limited time special being offered on them. Be sure to click on each machine to see any further discounts we may be offering on their individual product description pages or any additional discounts that may be automatically triggered when they are added to your shopping cart. * All prices shown above are our regular sale prices and do not reflect any special prices or coupons that may be available from time to time. How Long Will The Pitching Machine Last? The number of years you can reasonably expect a pitching machine to last is really one of the most important factors of all, yet it is something that very few people consider. The easiest way of determining how long a pitching machine may last, is to look at the pitching machine's warranty. Manufacturers aren't going to give a 5 year warranty on a product that won't last at least that long! If your child is very young and just starting to play ball, you may not know for sure if they will continue playing the game in coming years. It might be a wise idea to hold off on a more durable and expensive pitching machine for now and, instead, get one of the Heater Sports backyard pitching machines. In fact, if they are very young, your best bet would be to go with a lite ball pitching machine, which helps them develop their timing and alleviate their fear of getting hit with a ball. 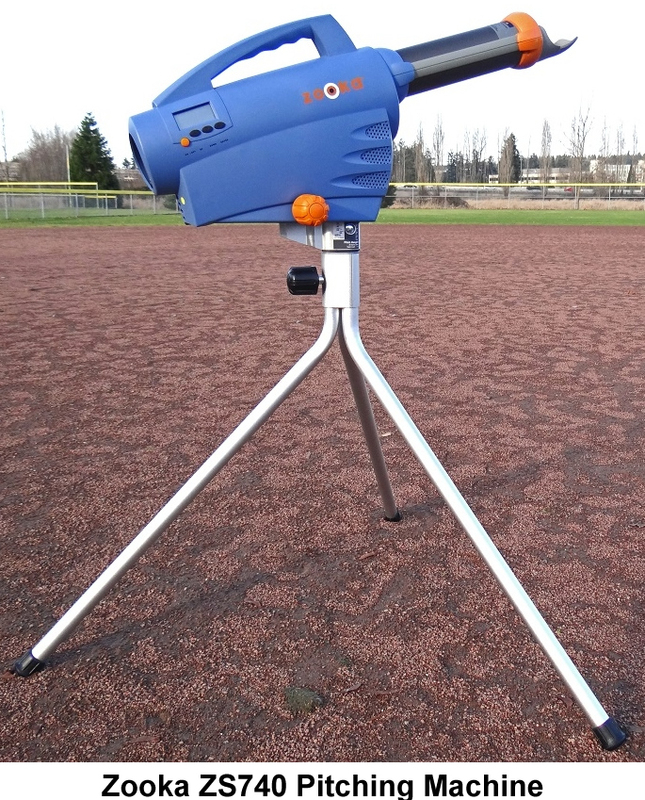 Another option for parents who have younger players that definitely show interest in the sport is to go with a Zooka pitching machine. Although they only have one year warranties, we know plenty of people who have been using those machines for more than five years with no reported problems. It only makes sense; there are so few moving parts to Zooka pitching machines. If they are older and have been playing for a few years, it's pretty much a sure thing that they will be playing for quite a few more years. In that case, selecting a pitching machine that's well made and has a five year warranty like most First Pitch, JUGS, or Rawlings/Spinballpitching machines makes far more sense. Although all of those companies have 5 year warranties, JUGS has a much longer track record, having been in the pitching machine business for more than 40 years. Many of JUGS' customers claim their machines last at least ten years. Spinball/Rawlings machines, on the other hand, are the only pitching machines that include the wheels in their warranty, so they actually offer the best 5 year warranty. The best warranty of them all, however, is offered by BATA Baseball. All of their machines now have a 10 YEAR WARRANTY. They will pay to repair or replace any part of their machines for a full ten years (tires excluded). If one of their machines needs to be repaired in the first 3 years, BATA pays to send the machine back to you after repairs. After that, the customer is responsible for shipping both ways. Although the Louisville Slugger pitching machines don't have a very long warranty, that is due to the fact that the springs on their machines wear out. Replacement springs are only about 20 bucks, though, and are super simple to switch out. You also need to consider how often the pitching machine will be used. Will there be multiple people using it? Will it be used for team batting practice? If the answer to either of those questions is yes, you'll get far better wear from the Zooka, First Pitch, JUGS, Rawlings/Spinball and BATA machines. Also important to note, JUGS, Rawlings/Spinball, BATA and First Pitch pitching machines DO NOT place warranty restrictions on team use, meaning a baseball or softball team gets the same warranty as an individual - something many other pitching machine manufacturers don't offer. 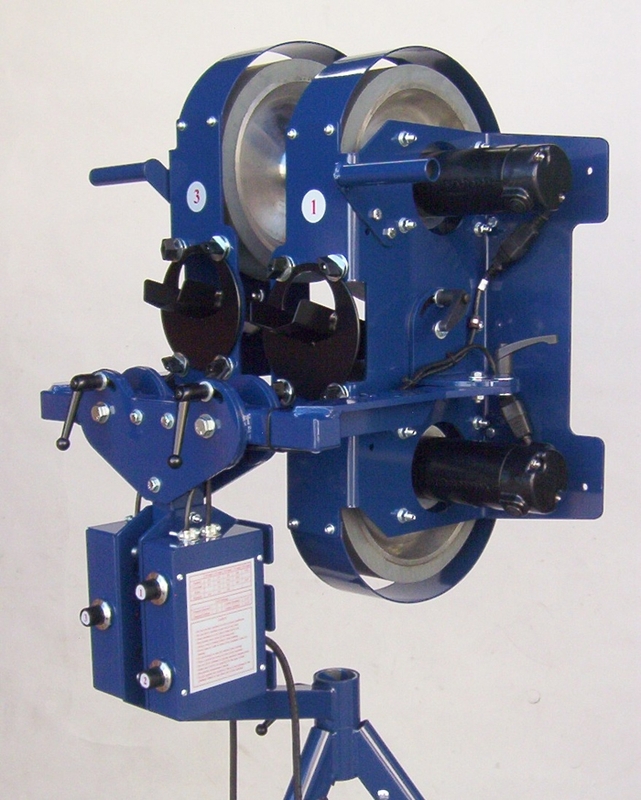 Do You Need A Baseball Pitching Machine, Softball Pitching Machine Or Both? Who are the ball players in the family, both at this moment and in the future? If there are both baseball and softball players, you'll definitely need to get a combination baseball and softball pitching machine. The family next door has a 13 year old boy who plays baseball, a 16 year old girl who plays fastpitch softball and a dad who plays in hardball and slow pitch softball leagues. They also have a six year old boy who is already swinging a bat at lite balls and looks like the next Babe Ruth! They have a First Pitch Curveball Pitching Machine. Although it is not exactly a cheap machine, it is built to last, has reversible legs for both softball and baseball and throws every kind of pitch imaginable - slow pitch softball, fast pitch softball and baseballs up to 105 MPH. It's probably the best machine made for fielding practice, too, and can throw real balls, dimple balls and even lite balls. Because it is a two wheel machine, it can throw any pitch a major leaguer can - fastballs, curves, sliders, screwballs and even knuckleballs. If a machine that can throw every pitch imaginable and can throw either baseballs or softballs is in your game plan, ANY of the Rawlings/Spinball Sports machine will do the trick and are what we consider to be the best value. The Spinball Wizard, Rawlings Pro Line 2 Wheel and Rawlings Pro Line 3 Wheel pitching machines are all top of the class! 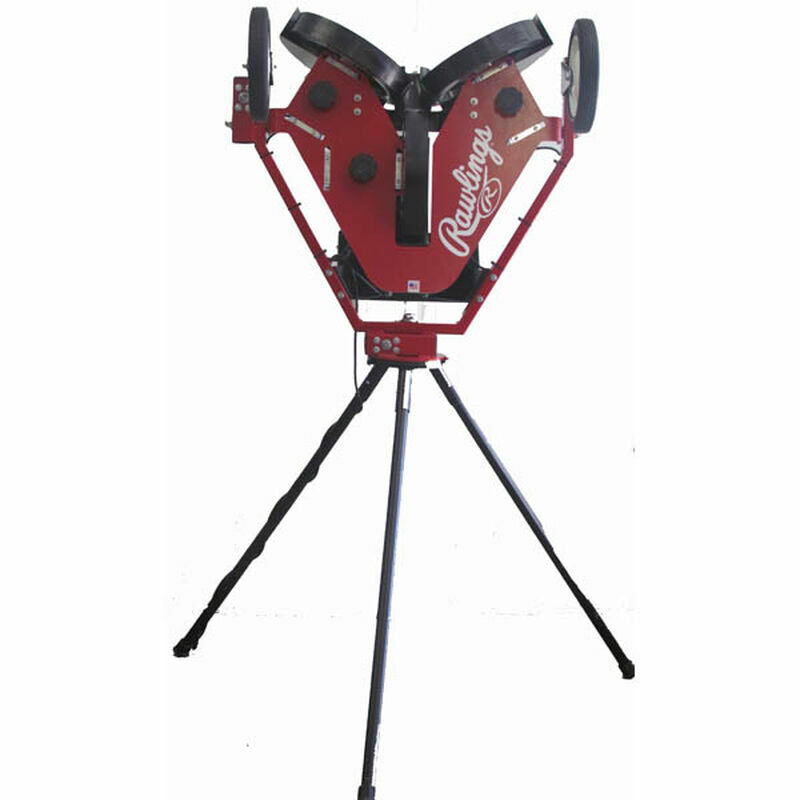 For folks who don't need a curveball pitching machine but want a combination baseball/softball pitching machine that is great for defensive drills AND hitting, the best one on the market is the First Pitch Ace pitching machine. It can throw overhand and underhand as well as put backspin or topspin on a ball. Having backspin on fly balls and topspin on grounders means far more realistic fielding drills. It also means that you can easily throw sinking or rising fastballs. How Fast Is The Pitching Machine (and how much does it matter)? One of the things everybody wants to know is how fast a pitching machine will throw balls. Although this is certainly an important consideration if the machine is going to be set up at regulation distance, it becomes far less of a consideration if you are using the pitching machine in a 20 or 24 foot home batting cage. For instance, a machine with a top speed of 50 MPH may seem too slow for a high school player, which is true when pitching from the regulation distance of 60 feet, 6 inches. When you are much closer to the pitching machine, the ball gets to you much faster, though. In a 24 foot batting cage, that 50 MPH fastball causes you to react much quicker and seems like a 126 MPH fastball - faster than any pitcher at any level can throw! To compute the "seems like" speed, take the regulation distance, divide it by the shorter distance the machine will really be from the back of the "plate," and multiply by the speed. If you will definitely be using your pitching machine from regulation distance, speed is a super-important consideration. Otherwise, not so much! Does the Pitching Machine Need to be Portable? Sometimes, you may want to use a pitching machine in an area where there is no electrical outlet. If so, you are going to need to purchase a 120V generator at your local hardware store in order to power most pitching machines. Some pitching machines are extremely heavy, too. BATA, JUGS and First Pitch pitching machines weigh anywhere from 65 to 115 pounds. You can add a wheel kit (found in the pitching machine accessories section of this website) to BATA pitching machines and First Pitch pitching machines which help a great deal with transporting their machines from your car to the field. You'll probably want some help raising and lowering the heavier machines from the car if you value your vehicle's paint job, though! Heater pitching machines don't have wheel kits available. Many JUGS baseball pitching machines are designed so that the machine can be held by the legs and rolled onto a field on its wheel(s) - very convenient!Rawlings/Spinball Sports pitching machines are about half the weight of competitors' machines due to the aerospace-grade alloys they use in their machines, so no extra wheel kit is necessary. Because it has a third wheel and motor, naturally making it heavier, their top of the line Rawlings Pro Line 3 wheel pitching machine has a wheel kit included as part of the frame. Even with that third wheel and motor, it's still no heavier than other companies' two wheel pitching machines, however. Zooka pitching machines run on an internal rechargeable battery that can throw 500-800 pitches before needing a recharge and are less than 30 pounds. They are probably the best option for people who want a super portable pitching machine. No cords or generators to deal with at all! None of the Louisville Slugger pitching machines require any electricity at all - not even a battery. They use high tension springs to launch the balls. Therefore, you can literally set them up in under a minute - anywhere! Their baseball pitching machines also weigh considerably less than motorized pitching machines, weighing from 12-25 pounds. If portability is your #1 concern, the Louisville Slugger machines may be your best bet! What Kind Of Tires Does The Pitching Machine Use? Because they were the first company to sell pitching machines that used tires to propel a ball, JUGS Sports has always been the measuring stick that people have used when comparing various pitching machine models. The first is not necessarily the best. In fact, it almost never is. Nowhere is that more clear than when looking at pitching machine tires. Pneumatic tires are air filled tires, similar to the tires on your car, only a bit smaller. These were the original pitching machine tires and you can find them on all pitching machines made by JUGS Sports, First Pitch and Heater Sports. Pneumatic tires wear out faster than solid tires and they take longer to recover between pitches, meaning you may have to wait 10-12 seconds between each pitch. Also, they tend to flatten out at higher speeds, which means you may have to adjust the gap between the wheels (on two or three wheel machines) or the wheel and the stop plate (on a one wheel machine) every time you significantly change pitch speed. Worse, the air pressure has to be exactly right in the tire(s) or your pitching machine will not pitch accurately. The temperature outside along with the number of pitches a machine has thrown can have an effect on the tire pressure, as well. If you decide to choose a pitching machine with pneumatic tires, just be sure that you have a portable way of inflating those tires as well as a tire pressure gauge handy. Solid pitching machine tires are pretty much what you would expect them to be. They are not filled with air and are similar to the wheels on a lawnmower, only a little larger and definitely more advanced. Most of the more modern pitching machines have switched to solid tires and you can find them on all BATA Baseball, Spinball Sports and Rawlings pitching machines. Solid pitching machines tires have several distinct advantages over pneumatic tires. Solid tires last significantly longer than pneumatic ones and they recover twice as fast between pitches, meaning you can throw a pitch every 5-6 seconds with a pitching machine that has solid tires. They also hold their shape no matter what speed the pitch is, so you needn't worry about having to change the gap between the wheels or wheel and stop plate when making significant changes in pitch speed. Better still, you never have to worry about tire pressure with a solid tire. There is no need to bring an air pump and tire gauge with you to the ball field or out to your batting cage. You can expect a consistent pitch time after time, no matter what the temperature is outside or how many balls your pitching machine has thrown. Do You Want A Pitching Machine That Can Be Used Solo? A very important question you need to ask yourself is whether or not there will always be someone around to feed balls into the pitching machine one at a time. If not, it'll be impossible to practice your hitting or fielding drills. In order to practice solo, a pitching machine HAS TO have an auto ball feeder. 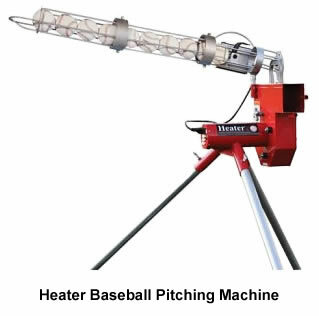 Some of the Heater pitching machines include a free auto ball feeder and if not, they can be added to a machine for about $50.00. 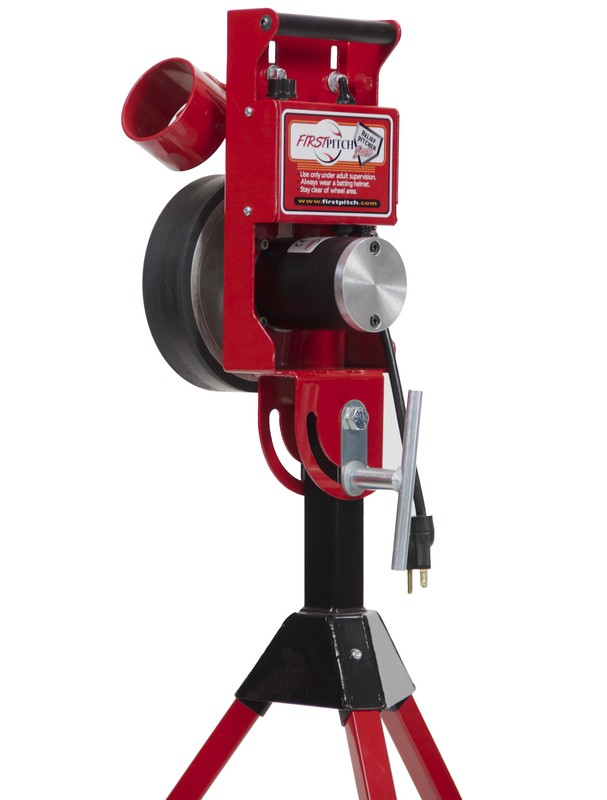 The BATA, JUGS, Rawlings/Spinball and First Pitch pitching machines DO NOT come with auto ball feeders; although, they can certainly be purchased and added to their machines if you don't mind investing an extra $315-$700. In between, is Zooka. Their autofeeders run less than $260 (including shipping) and hold more balls than most feeders. Whether or not it is worth paying extra for a ball feeder in order to practice alone comes down to whether you want a higher quality, longer lasting pitching machine or just one that you can only expect to get a few years use out of. 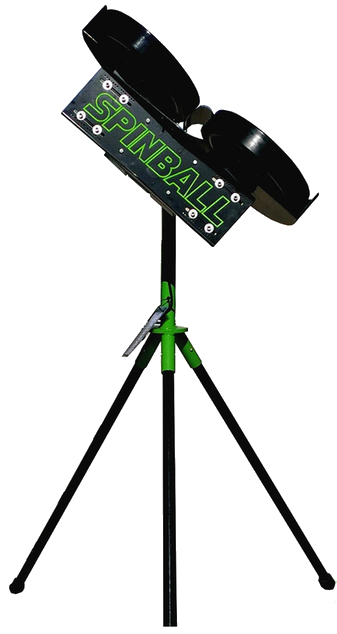 Many parents purchase a pitching machine initially and add the auto ball feeder later - sometimes as a birthday gift! Do You Need A Curveball Pitching Machine? As kids get older, they are going to start facing pitchers who throw curves. As they advance even further, pitchers will be throwing curves, sliders, screwballs and maybe even knucklers. Having a pitching machine that you can practice hitting curves with is very important when you get up to the higher levels. What kind of curves, though? When ball players progress to the point that they need to practice hitting curves, the pitchers they are facing are typically throwing more than just a straight curve. Pitching machines that only have one wheel use a "stop plate" and can only throw basic curves - usually side curves only, from the left or the right. 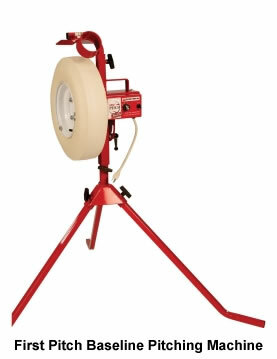 These are always the cheapest curveball pitching machines because they only have one motor. Examples of one wheel style pitching machines that can only throw a straight curve are the Heater Pro pitching machine and the BATA B1 pitching machine. In order to throw anything a real pitcher can throw, your pitching machine needs to have two variable speed wheels. By changing the speed of one wheel relative to the other, you can pitch screwballs, sliders, curveballs, fastballs and even knuckle balls. If it has a pivoting head that can be easily tilted like the First Pitch Curveball Pitching Machine, Spinball Wizard Pitching Machine or BATA 2 Pitching Machine does, you can even mix in 3/4 curves, overhand curves, sliders, knuckleballs and more. If you are on a tight budget, but still want a pitching machine that can throw as fast as the pros do, Heater Sports has recently added the Heater Deuce-95 Two Wheel Curveball Pitching Machine to its lineup. It's about $600 less than next cheapest two wheel machine on the market that can throw that fast. Just keep in mind that it only has a one year warranty and can only throw baseballs. It does come with an automatic ball feeder, though. Something that few people ever consider is how a pitching machine that throws curveballs can be used for fielding practice. Catchers can certainly benefit by learning how to catch and block curves that frequently become wild pitches. Infielders can benefit by practicing grounders from a curveball pitching machine, too. Any infielder can tell you that the spin on a one hopper is very different coming off the bat of a left handed hitter than it is from a right hand hitter. Setting up a pitching machine to throw grounders with a side spin can really take a player's defensive skills up a notch! Where Is The Pitching Machine Manufactured? Many people are very interested in supporting American companies and prefer to buy Made In The USA products over ones that are manufactured in China. Even if patriotism or supporting American companies is not at the top of your agenda, there is another very important reason to consider purchasing a pitching machine that is made in the U.S.A. If your pitching machine needs to be repaired, it can take a very long time to get it fixed if those parts have to be ordered from overseas. How Much Does The Pitching Machine Cost? Finally, I'll get to the one question that is often the only one that people ask - "how much does it cost?" As you can see from the above, you can't let price, alone, dictate which pitching machine you should buy. Obviously, most people have limited budgets and often need to sacrifice some of their "wants" for more realistic "needs." Decide which of the above factors are the most important and buy the most affordable machine that meets all or most of those needs. With most people, durability tops their list. Best Pitching Machine Value Under $500: In this category, it all comes down to whether an automatic ball feeder is essential. If you MUST have a ball feeder, the best value is the Heater Real Baseball Pitching Machine. If you want to work with your child and a ball feeder is not important, the best value is the First Pitch Relief Pitcher - especially if you want a machine that can throw baseballs AND softballs. Please keep in mind that any real ball pitching machine in this price range can only throw fastballs and changeups. Best Pitching Machine Value Under $1,000: With a top speed of 62 MPH and a 10 year warranty, the best pitching machine value under $1,000 is clearly the BATA-1 pitching machine, which is only $949. It's super durable Goodyear soft tread tires last much longer than other pitching machine tires and because they are solid wheels, they don't have to be constantly monitored for the proper tire pressure. Even better, the wheels are covered so there is no chance of your fingers or clothing get caught in the machine, causing injury. If you can afford $154 more, the BATA B1 pitching machine offers all of the great features of the BATA-1 but it can throw curves as well as fastballs up to 70 MPH. Best Pitching Machine Value Under $2,000: This one is a little bit tougher choice because there are two pitching machines that may be the perfect choice, depending on how long you plan to use your pitching machine. Because it is only $1,599, it is not only less expensive than all of its counterparts, but it is significantly lighter too, the Spinball Wizard is clearly the best value pitching machine priced in this category. It can throw fastballs, curves, knuckleballs - you name it - at speeds up to 100 MPH. Another fantastic choice in this category that costs a little bit more, the BATA-2 ($1,799) also throws every pitch imaginable up to 100 MPH. A staple of many professional baseball teams' practices, the BATA-2 stands head and shoulders above all other two wheel pitching machines because of its outstanding 10 Year Warranty. Many people are more than happy to pay more for a machine with double the warranty period! If you plan to use your pitching machine solo, the automatic ball feeder for BATA pitching machines is also an incredible value compared to the price of a Spinball/Rawlings ball feeder. Of course, the Rawlings/Spinball feeder holds nearly twice as many balls, so that may be worth the higher price of the feeder for you. Best Pitching Machine at Any Price: This is really a tough call, but we are going to give a slight edge to the Rawlings Pro Line 3 Wheel Pitching Machine, which is pretty much identical to the Spinball Wizard 3 Wheel Pitching Machine. 100% made in the U.S.A. by the same manufacturer - Spinball Sports - the difference between the two machines really comes down to whether you prefer to push buttons or turn knobs. With the push of a couple of buttons, you can change the pitch type, amount of spin and speed with a Rawlings 3 Wheel Pitching Machine. It even comes with a digital speed readout and built-in transport wheels, which makes rolling the pitching machine onto the field much easier. If you'd like to get an almost identical pitching machine to the Rawlings 3 Wheel and save a lot of money, the Spinball Wizard 3 Wheel Pitching Machine is what you want. It is $400 less, is made by the same company and has all of the same features except for the digital speed readout. Its control board is analog instead of digital so you turn knobs instead of pushing buttons but that's the only real difference. In fact, many people prefer the Spinball Wizard 3 wheel machine over the Rawlings 3 wheel machine because they can turn a knob to the pitch speed they desire faster than they can cycle the speeds up and down with buttons. Also there are more options for the amount of spin with the Spinball Wizard 3 Wheel pitching machine. NOTE: This table is best viewed from a device with a full screen browser like a desktop, laptop or tablet (in other words, not a phone). * Price shown is for baseball-only or softball-only model. Combo baseball/softball machine costs extra.